Although Maine's trapping regulations have been modified to reduce the chance that a lynx will be caught in a trap, accidental catches still occur. Trapper's that are setting traps during Maine's regulated trapping season for upland furbearers are required to report accidental catches of lynx to IFW. Call 207-592-4734 Phone monitored: 24 hrs a day and 7 days a week during the trapping season. 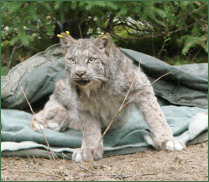 Captured lynx must be reported to a game warden or biologist of the Department as soon as possible and prior to removing the animal from the trap, unless a Department official cannot be reached in time to prevent injury to the lynx. Any lynx released under this provision must be reported to the Department within 24 hours from the time it was discovered. When a lynx is caught, IFW Wildlife Biologists and Game Wardens document how the animal was captured, assess the lynx for any injuries that it may have incurred, assist with releasing the lynx, and check compliance with state trapping regulations. Catch circle must be clear of woody vegetation or debris except small sticks and rocks or rotten wood used as backing, guides, or blocking. KILLER-TYPE TRAPS set on land (except blinds and sets under overhanding banks (see Trapping and Hunting Laws for details). Can be made of wire, wood, and/or plastic. If the entrance hole is greater than 4 x 4 inches, the device must include a baffle. Trappers are required to report the capture of lynx to a Game Warden or Department biologist as soon as possible and prior to removing the animal from the trap, unless a Department official cannot be reached in time to prevent injury to the lynx. Any lynx released under this provision must be reported to the Department within 24 hours from the time it was discovered. Report Lynx Captures to (207) 592-4734 (24 hours a day and 7 days a week).In remote areas, phones are available at NMW checkpoints, custom gates, sporting camps, and logging operations. During the early canid and muskrat trapping season, it is illegal to set a trap using exposed bait or visual attractor. During the regular trapping season, traps cannot be set with 50 yards of bait that is visible from above.